It’s well known that modern lifestyles, characterized by prolonged sitting, little physical activity, disordered sleep, and consumption of highly processed food, adversely affect what goes on inside the human body. When compared to contemporary, industrialized humans, hunter-gatherers and other traditional people have, on average, markedly lower levels of triglycerides, CRP, LDL, and leptin circulating in their bloodstream, a more diverse microbiota, and lower blood pressure, among other things. What is less known is that modern lifestyles also adversely affect the physical appearance (phenotype) of the human body, by affecting growth, development, and expression of genes involved in regulating skin color, hair texture, and so forth. Everyone knows that they gain fat, get pale skin, and lose muscle if they eat crap, don’t spend time in the sun, and don’t exercise; however, a lot of people are unaware of the fact that their body composition and skin color aren’t the only visible characteristic of their body that are affected by their diet and lifestyle. Last year I published an article here on the blog entitled How the Western Diet Has Changed the Human Face. In that post I presented evidence showing that the human craniofacial structure has changed over the past 10.000 years, and that malocclusion is a disease of civilization. In today’s post, I’m going to take this discussion a step further, by expanding it to include all of the human body – not just the part that’s found from the neck up. Paleolithic humans obviously didn’t take pictures of themselves which they left for future generations to look at; hence, we don’t know exactly what our primal ancestors looked like. However, we do have a general idea. The fossil record indicates that Paleolithic humans were tall and had broad shoulders and a well-developed craniofacial structure, among other things (1, 2, 3). Moreover, it shows that the Agricultural Revolution was accompanied by an increased incidence of malocclusion, tooth decay, and osteoporosis, as well as a decrease in stature (1, 2, 3). Further changes have accumulated in the years that have passed since then. When compared to contemporary humans, Paleolithic humans carried less fat and more muscle mass and had broader shoulders, better posture, and wider, more well-developed faces and jaws (1, 2, 3). Obviously, these are generalizations: not every Paleolithic hunter-gatherer was lean and robust, and not every modern humans is weak and fat. However, in general, it’s safe to say that there is a distinct difference between the physical characteristics of modern and ancient people. Homo sapiens idaltu (Herto man), an extinct subspecies of Homo sapiens that lived during the late Paleolithic. Like contemporary humans, Homo sapiens idaltu had a high round skull and flat face. The idea that the physical appearance of Homo sapiens has changes since the time we lived as hunter-gatherers is further supported by studies of modern, non-westernized communities. Contemporary hunter-gatherers and non-westernized people are obviously not a perfect replica of ancient humans; however, they do represent a pretty good match. Humans who live in an environment that bears resemblance to the Paleolithic milieu tend to be lean, moderately muscular (they are no bodybuilders, but they are not weak either), have good eyesight, healthy-looking skin, good posture, and wide, well-developed faces (1, 4, 5, 6, 7). Again, these are generalizations. Obviously, not all contemporary humans are similar with regards to their physical characteristics. The same is true for traditional, non-westernized people. Some are taller, stronger, and more robust than others. However, when viewed as a whole, it’s clear that they have certain physical traits that separate them from industrialized people. To illustrate this, I’ve included a couple of photos of non-industrialized, traditional people below. Notice the lean frames, wide nostrils, well-developed faces, clear skin, and moderately muscular bodies. Explanation: Lower Crossed Syndrome (LCS), accompanied by poor posture and excessive anterior pelvic tilt, is an extremely common condition in industrialized societies. Explanation: Upper Crossed Syndrome (UCS), accompanied by a forward head posture and increased cervical lordosis and thoracic kyphosis, is an extremely common condition in industrialized societies. Explanation: Virtually all westernized people get acne sometime during their life. 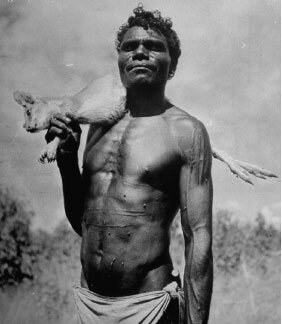 Hunter-gatherers, on the other hand, rarely get skin lesions (6). Acne is a disease of civilization. Explanation: Contemporary humans carry a lot more adipose tissue than ancient humans did. Explanation: Contemporary humans carry less muscle mass than ancient humans did. In particular the glutes and upper back muscles have gotten weaker. Explanation: Human faces have gotten smaller and thinner since the Paleolithic. Explanation: Paleolithic humans probably had broader, more muscular shoulders than contemporary people (1). Wild animals that live in an environment that is well-matched with their genetic make-up tend to be lean and physically fit. Domesticated animals, on the other hand, generally carry a lot of fat mass and are at high risk of developing various types of chronic diseases. This is particularly true for animals that receive drugs (e.g., antibiotics) on a regular basis, eat a diet that is incompatible with their biology, and are confined to unsanitary living conditions. Humans are not exempt from this “rule”. We too are a product of evolution. The human body evolved to require certain types of stimuli in order to develop and grow correctly. If we step out of the environment(s) the human body is accustomed to live in and step into an environment that it is inadequately adapted for, bad things happen. We don’t grow or develop correctly, we accumulate adipose mass, and ancient bodily systems that worked fine in the previous milieu start to malfunction. This is what has happened over the past millennia, as we humans have left nature in favor for an industrial, manufactured environment. When we think about it, it’s not really surprising that hunter-gatherers (both contemporary and ancient) are lean and have robust physiques. In order to survive in an ancestral, natural environment, you have to be fairly lean and physically fit. A Paleolithic man who was weak, sick, and/or fat probably wouldn’t survive very long. If he had poor eyesight or other similar dysfunctions, he would have trouble getting a hold of food and evading dangerous animals and he wouldn’t contribute as much to his community as a fit individual. Hence, it’s unlikely that he would we able to pass on his genes. This is in stark contrast to how things are like today. Today, we have buffers that help us control the symptoms of many physical disabilities. Unfortunately, these buffers don’t fix the problems, they only mask them. For example, glasses don’t cure poor eyesight (Actually, glasses and contact lenses may make your eyesight worse. ), they just make it easier to live with the problem. Today, we no longer have to hunt and gather for food, build shelter, or evade dangerous animals. Good physical fitness is no longer a prerequisite for survival. You can be fat and weak and be physically disabled, but still make it. This is key to understanding why our physical appearance has changed so much over the past millennia. There’s no doubt that there are many upsides to being a human in the 21st century. I think few people would say that they would like to leave their modern lifestyle behind in favor of a hunter-gatherer lifestyle if they had the chance. However, there are also many downsides to being a human in the 21st century. We’re surrounded by foods, technological devices, chemicals, and so forth that have the capability to do us harm. If we’re not careful and cautious about what we eat and how we live our lives, we may quickly end up sick and weak. Moreover, we may develop bad posture, obesity, acne, and other health conditions that unfavorable affect our physical appearance. Pictures: 1 (FreePik.com), 2, 3, 4, 5 (CC picture by Dietmar Temps), 6 (CC picture by Ian Beatty), 7 (CC picture by A_Peach), 8 (Picture by Staffan Lindeberg. Used after permission was granted), 9 (CC picture by Ninaras, 10 (Picture by Staffan Lindeberg. Used after permission was granted). I always like to point out how evolution actually works, because there is a general misunderstanding. Aside from the fact that 10kyears are a scant in evolutionary terms, it’s the selective pressure that plays a master role as well. Nowadays we are going nowere because we hardly have any selective pressure, aside from something related to infections resistance in crowded cities. If you have poor jaw development, you fix it, if you have a poor sight, you put on glasses, if you are sick, you manage the disease with drugs..you don’t have to be fit to live here and you don’t mate only if you are fit. Almost everyone is able to reproduce irrespective of his fitness. We have not been evolving in this sense since the dawn of civilizations. We had pale adaptations regarding epigenetic switches and crude SNP that barely allowed us to survive, not being fit until our 70s.